Worth 4 Tier Foldable Metal Plant Stand keep your favorite plants stunningly displayed. 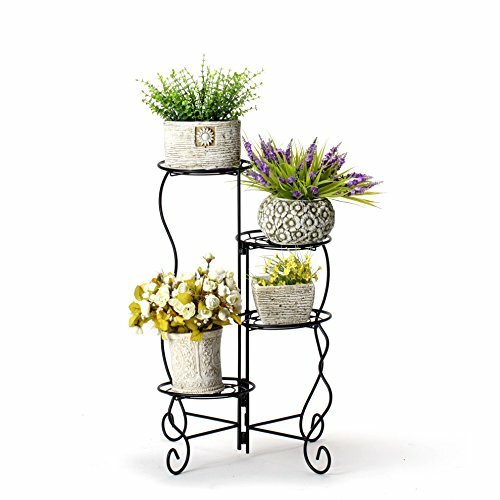 The metal that makes up this planter display stand is an elegant winding stair shape and coated with a classic black finish that fits in beautifully with any decor. It features a metal railing to help protect your plant from falls. Simply place up to 4 favorite plants on the shelves. Bring classic style and a touch of your favorite natural greenery to any room in your home. TRANSFORM YOUR LIVING SPACE: With gorgeous lines and a simplistic black finish, take your drab floor-sitting pots to an elegant new level. GROW FULLER FLOWERS: With varying heights and multilevel shelves, your plants have room to grow, bloom, and blossom while catching just the right amount of sun. WEATHER RESISTANT FINISH: The shiny black powder coating can withstand ice cold temperatures without warping or chipping - perfect for a front porch display. FOLDABLE AND ADJUSTABLE: Switch things up by moving your flower display around your home, office, or patio with folding levels that fit tight corners and open-spaces. 100% RISK FREE PURCHASE: We offer a 3-YEAR WARRANTY on all Worth Gardening products- no questions asked! Call or Email us at our Worth Garden website! If you have any questions about this product by Worth, contact us by completing and submitting the form below. If you are looking for a specif part number, please include it with your message.